Best thing I've ever done for me personally was to go see Steven Jacobs about implants. Losing a tooth can be devastating. You can feel self-conscious and suffer a lack of self-esteem. Did you know that your tooth could be replaced quickly and easily with a dental implant? The screw will be surgically placed directly into your jaw by your dentist. Its shape and material are optimal for close contact and ultimately fusion with bone, providing maximum stability later on. Depending on the condition of your mouth and jawbone, the implant 'abutment' (the crown or bridge that fits onto the screw) may be added immediately after the screw is inserted, or sometimes it may be added at a later date. It will blend in perfectly with your natural teeth in colour and shape. Either way, there will be some healing time. 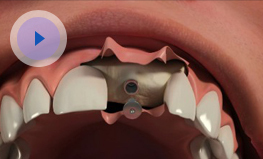 The screw will slowly mesh with the bone, becoming a natural component of your jaw. Your implant will look and feel exactly like a normal tooth: no one will ever know, and even you might forget! You will still be able to bite and chew normally, and the bone in your jaw will remain intact over time. A beautiful, natural smile that is all your own. The reassuring knowledge that your implant will last you a lifetime if properly cared for. Full function restored, which means freedom for you. Bone density will be maintained and so will the integral structure of your face. After being devastated about losing my upper right first premolar the only true option for me was to have a permanent replacement which meant an implant. I am so glad I went to Stephen. He was so professional and uses the most up to date procedures and technologies making the whole process more comfortable and relaxing. The whole process took just slightly over 2 months, which included the extraction of my tooth and implant being placed immediately after extraction along with a temporary crown. I am now delighted to have my smile back.